VANCOUVER, B.C - The Vancouver Whitecaps are preparing for their final Cascadia clash with the Portland Timbers this Saturday night at Providence Park. Vancouver has already taken four points from a pair of matches with the Timbers in the spring. Carl Robinson's boys are expected to be short-handed with a trio of players nursing injuries. Sam Adekugbe (Ankle), Pedro Morales (L Calf), Pa Modou Kah (R Calf) are coming along, but not yet back to full fitness. Gold Cup duty will prevent Darren Mattocks and Kendall Waston from joining the Whitecaps. Costa Rica called up Waston on Wednesday leaving the Caps centre-back depth, thin at best. Pa Modou Kah is progressing, but seems doubtful to play against is old club. Rookie Diego Rodriguez is still looking to find his form and comfort level with the first team. The 24 year-old Uruguayan played 45' minutes in Whitecaps FC 2's 2-2 draw vs the Colorado Springs Switchbacks on Wednesday night at UBC. Carl Robinson is likely to start the youngest centre-back pairing in Major League Soccer this season with the inexperienced Tim Parker and Christian Dean. Although Robinson would not outright confirm the inclusion of Dean in his starting eleven, the gaffer has all the confidence in the ability of all his players. Dean made his first career MLS start last season away to FC Dallas on September, 13. He has yet to see the pitch in MLS this season and hopes to emulate his best friend who has made great strides in his rookie season. "I'm excited. I've watched Tim get a couple of starts and he's been great. I'm just going to go and try to play with the same intensity and the same way that he's played. (Laughs) He's been great so I just hope that I can show him up possibly." As competing central-defenders Parker and Dean have a strong relationship off the pitch. Both are 19-days apart in age and turned 22 years-old earlier this year. 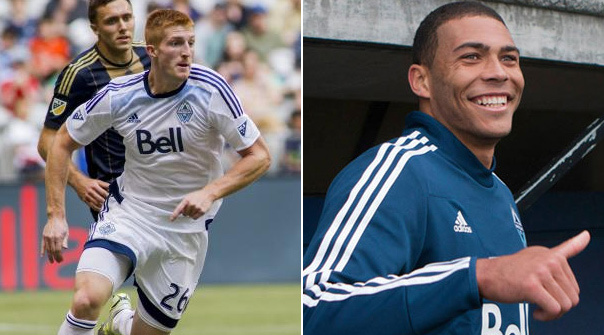 The energy, hustle, and endurance Parker and Dean have makes up for their inexperience as MLS footballers. Caleb Porter and the Timbers will no doubt be looking to take full advantage of an unseasoned Vancouver centre-back duo. Dean isn't bothered with the critics, and pundits. He knows he just has to go out and play his best game. "Yeah we lack experience, but I think we make up for it in athletic ability. He showed that he can play and I believe that I can play as well. It's just something that we're going to have to listen to the critics and just brush it back." Before the season began, Carl Robinson was questioned for his stockpiling of centre-backs. The Welsh Manager wanted to carry five centre-backs and once proved that he knew what he was doing. Kendall Waston, Pa Modou Kah, Diego Rodriguez, Christian Dean and Tim Parker are exactly the kind of depth Robinson has looked for and found stability with. With unforeseen circumstances you can never have enough centre-backs. Robinson is showing his smarts with his strong commitment to defense. "I've been in football a very long time and sometimes when you're trying to build a squad people only see the starting eleven. I don't, I see from 1 to 25 on my roster. Carrying five centre-backs is difficult sometimes, because you play two centre-backs, and you have one on the bench and two are left out. That's why the USL is an important tool for us, for the young players to get games or experienced players who haven't been getting minutes to get games. We use that as an important tool. I know that five would be needed and I carry five for a reason and the reasons are going to be shown maybe on Saturday." Vancouver will receive a boost with the return of vice-captain, Russell Teibert. Canada crashed out of the Group Stage of the Gold Cup, and thus Teibert returned to the Whitecaps. Despite the lack of goals and disappointing results for the 'Red and White', Teibert enjoyed his time with the national team and hopes the tournament was a turning point for what is to come for Canada. The Niagara Falls, Ontario native, is looking forward to earning some minutes and getting back his full fitness levels with the Whitecaps. "I think I'm known for having decent lungs and being able to run a little bit. I don't know if I've necessarily lost my fitness, but I do need to get some minutes and to play 90 minutes hopefully soon. Whatever the role the coach wants me to play, I'll be happy to play this weekend." The Whitecaps depth will certainly be tested in the 'Rose City' as they shuffle the deck and looked to avoid a three-match losing streak. Parker and Dean should be given every opportunity to play against a top team and prove their managers instincts correct and the Cascadia darby never fails to disappoint.